Hi there! I know it's late. Today was a busy one. I did manage to make some Irish Soda Bread for the feast day. My kids love this stuff but if I made it more often, it wouldn't feel like a feast day treat, now would it? They had it with scrambled eggs and veggie sticks tonight for dinner. GF Hubby did not, obviously. I was going to make colcannon but ran out of time so instead, I'm going to take a page from Dawn's notebook and make Shepherdess Pie tomorrow for a continuation of the feast today along with something for Candlemas. I don't think St. Brigid will mind. You could also bake it in a Dutch oven for the same effect. It turns out a delicious, rugged, crunchy outside and soft inside. Slice it thick when it's still warm or let it cool completely and you can slice it thinner. Happy Feast of St. Brigid! I'm obviously not well versed in baking. So this may seem like a dumb question, but here goes: What does placing the pan on top of the bread do for it while it's baking? Does it retain moisture? I made Irish Soda Bread for the first time last year and I just put the loaf on a cookie sheet. Now I'm wondering if I could have had it turn out better. It's only for certain kinds of bread and I think it has to do with trapping in the heat and the steam. Steam is what gives you a crunchy outside and a soft inside. French baguettes are usually made with an infusion of steam in the baking process, so are Italian moon rocks. Here is a post I found that goes into more explanation. Beautiful! 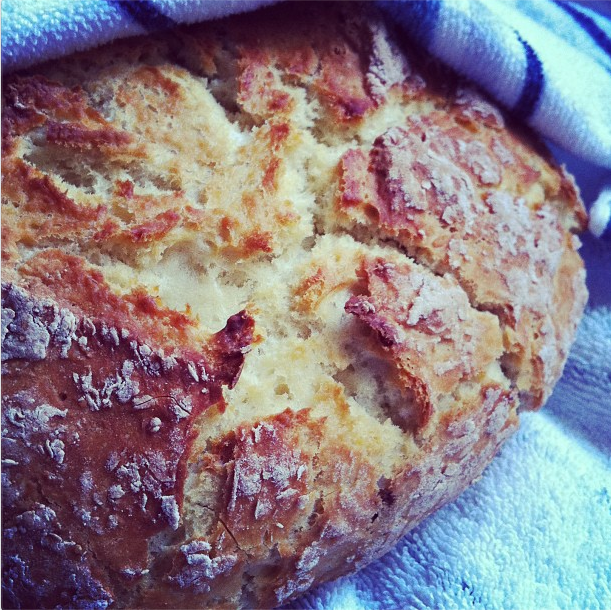 I love to bake bread, but I've never made soda bread! I'll have to file this away for St. Patrick's day!